As I lie awake in the early dark hours of the morning, I wonder what percentage (statistically) of the human race will ever actually have the opportunity to risk it all for the sake of following their heart. Today is the 27th day I have been unemployed and living by, what I call, the grace of God. I am hoping the worst days are behind me – the mental self-torture of running the events over and over in my mind that led to the demise of a certain lifestyle (my career) in favor of what many would consider to be a high stakes risk: The fear of losing my house, which would mean a loss of independence or an undesirable location of living, the fear of losing the man I love, and the fear of not being able to run my candle business – all valid concerns that have had me on anti-anxiety meds for the first 20 days of this sabbatical. Yet, I lay here and feel the peace of knowing, in this moment, I am exactly where I am supposed to be and doing what I am supposed to be doing. 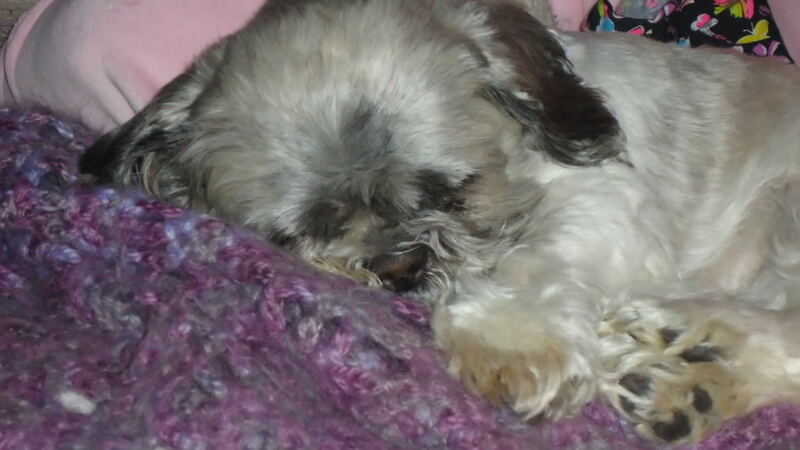 The sweet little snores of an aging Shi-Tzu lying next to me remind me of how fragile and temporal are those in our lives who we choose to love. I’m beginning to wonder if by risking it all and giving up “life as we know it” is the only way to ever experience “the peace of God which surpasses all understanding”. The inner knowing that no matter what comes to pass, all will be alright because, unlike many men, God keeps His promises. The first 2 weeks of being unemployed I was down with a virus so I barely recall feeling anything other than miserably sick every waking moment. I would tell myself at least 100 times a day that I have faith in the goodness and promises of God, but the panic in my stomach did not seem to be listening, hence the anti-anxiety medication. However, eventually, the tumultuous waves crashing against me have tended towards a softer ebb and flow: the morning prayers pour forth more easily, meditation no longer seems masochistic, and I am learning to connect with the inner desires of my spirit – to honor the thoughts and ideas that spring forth from The Spirit Within. I think I’m in for quite a ride on this journey to self-realization but I know I am not alone. My guardian angel comforts me and I AM that I AM within me quietly whispers to me to follow my intuition and heart, even though there is no promise of my mortgage or bills being paid. At this point (which is now 2 months after having begun writing this post), I am not in a place where I can recommend risking it all for the sake of your heart’s desire, but my hope and faith in the goodness of God are strong and I intend success for I know that each and every one of us came into this world to do something more than just pay the bills. Until the next magickal moment, may peace, love and light burn brightly within your hearts – (and may we all at least try to listen to our hearts). Ever taken a survey? Almost every questionnaire will require that you specify your religion: Buddhism, Christianity, Hinduism, Islam, Judaism; and many don’t even give that many choices. However, living in the 21st century has afforded us the luxury of having a vast amount of ancient wisdom and teachings, as well as an oversized portion of propaganda, at our fingertips and, at that, almost instantaneously. Of course how we choose to use the Internet is a free will decision. But, if used wisely, it can become a gift of divine will. When used correctly, our free will and the decisions we make can open the doors and gates to divine will. Well I have taken many, many surveys and the question still stumps me today. What religion am I? Well, I almost always answer Christian because I was raised by a Church of Christ preacher and his wife. Religion, in some respects, is business, so if we are asked this question to determine where 10% of our income may be going, then maybe it’s a useful question. 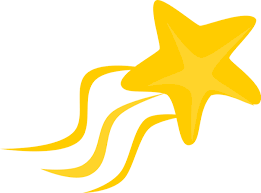 But what I’m getting at is that we can be very spiritual, live a life that is set apart from the ordinary, and serve a higher purpose without adhering to the tenets of one single “religion” or belief system. I believe in the spirit within that, when accessed by our conscious mind, is able to guide us to our chosen path so that our soul’s destiny may be reached. So, what religion is behind Candle Charms? There are Christian candles, candles honoring the heroes of Hinduism and Eastern theology, Greek God and Goddess candles, Egyptian God and Goddess candles, candles dedicated to the legends of the historic Celts and even animal spirit candles. Many may ask the question, “Did she just get confused and couldn’t make up her mind?” The answer to this question is that I am a spiritualist, one of the most ancient of all belief systems, mysticism being the most often practiced form of worship within this temple, my temple, first within my heart and also within my home which has become an outer manifestation of my soul’s worship. Do I pray the Lord’s Prayer, chant the rosary, celebrate Christmas and Easter, read the Bible and pray constantly to my beloved Lord Jesus? Absolutely and would recommend this to anyone. Do I light incense and offer food and flowers before Buddha and do I light a flame to the most ancient Hindu deities and honor the tradition of Japa, chanting, and meditation? Yes, daily. Am I so bold as to honor sacred Sabbats in Full Moon ritual? The answer is yes, yes to all. The path of the spirit of Candle Charms is in finding unity, beauty, truth, and divine inspiration among the vast array of the choices out there. To honor divinity is to honor the spirit within that guides us and leads us to our own path towards our individual calling and destiny. We are given a gift through the powerful, loving will of our creator, and how we choose to honor Him or Her, or them, is a gift that we can use to give to the Light by becoming all inclusive when it comes to the Light. Even within the esoteric realm of light workers, we will find differences of opinions and methods of worship which we may or may not feel comfortable being a part of, so the spirit within must prevail in love and respect instead of biased, prejudicial, judgmental attitudes. In choosing to walk a spiritual path, our lives, lived through short and long moments, become our daily worship. Home becomes sanctuary but also a realm of worship/a temple. By retreating from the hum-drum of the world into moments of deep silence and contemplation, the sounds of our hearts beat like ritual drums invoking a transcendental state, where we can step out of time into a shamanic dance and trance which is self-healing at a core level. By choosing to allow ourselves to receive the golden rays of God’s light of love, we allow ourselves to surrender to this love and trust it will lead us on the path that’s meant for each of us in claiming the destiny of soul purpose, rather than having to limit our choices based on religion. May the spirit that is within you guide you to your soul’s path. Until the next magickal moment, may peace, love and light burn brightly within your hearts. Use of a candle flame for scrying can be a powerful and illuminating tool. Today I was reminded that even though we all suffer the painful agony of the cross each of us bears in human form, it is not the suffering that need be at the center of our hearts. When we focus on and see the good in our lives (there are so many blessings to be thankful for), the inner light of the soul, which is within each of our hearts, begins to burn brighter and not only radiate a higher vibrational energy out toward the world and others, but also serves as a conduit in which to attract to itself similar or like energies. Like the breath or wind gives fuel for the fire, we must light the inner flame of the spirit within so that we can expand this flickering flame and become the bight, sparkling, illuminated shining stars we were born to be. Until the next magickal moment, may peace, love and light burn brightly within your hearts. I began making candles with my mother and sister in Orlando, FL in the early ’70s. My mother, not only a preacher’s wife and housewife, but also part Cherokee, part Jew, part angel and part psychic, taught my sister and I the Native American tradition of honoring kindred spirits and how to work with Mother Earth. Mom is gifted at sewing and making crafts and seemed to always be making something. One warm Fall day, my sister and I watched as she showed us how to make a totem pole. Through color and symbols it seemed to emanate its own powers. Unable to resist the stirring spirit within, I lifted it high into the southeasterly winds and said a quiet prayer. On that day long ago spent creating something beautiful out of almost nothing, I had no idea what the world would have in store for me, or what I may present to the world, but I believe this was the moment that charted the course that began me on a long and often rocky path leading to the creation of my passion and gift to the world, “Candle Charms”. That same year my sister and I received a joint Christmas gift from our mother. It was a candle making kit that came with 2 plastic molds, paraffin wax, dye and some paint. My sister chose to make an orange mushroom and I got to make a green frog. She came so perfectly out of the mold that I named her “Peace” and painted her eyes white with long wispy eyelashes and matching toes :). That was the first candle I ever made. I was 9 years old. Today, in the 21st century, I use natural palm wax (grown from a sustainable source that does not threaten the ecosystem) to make hand-poured pillar candles that contain the highest quality fragrance oils (which include the highest concentration of essential oils available on the market, which = less chemicals), and 100% cotton wick. The fragrances are mixed by myself with the intention of combining the energies of Mother Earth to correspond and align with the intention of the candle being created, I then add in the magic of color and herbs and throw in a dash of the oldest magic itself, quartz crystal, to synthesize and ignite the energies… and VOILA: A Candle Charm. Candle Charms are made out of my home in Woodbridge, VA. The following lines constitute the collection: SPIRITUAL & DEVOTIONAL CANDLES (Celtic, Christian, Eastern, Egyptian, Greek and Pagan); ANIMAL SPIRIT GUIDE CANDLES (including mythological); INTENTION CANDLES; and SPECIAL ORDER CANDLES (birthday, wedding, any occasion). 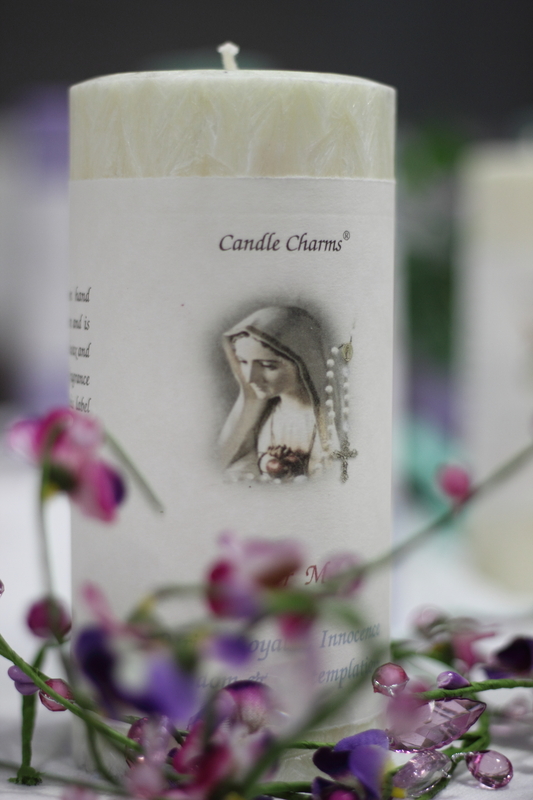 So you may be wondering what religion is behind Candle Charms? Many may think I just got confused and was unable to decide. There is no easy answer to this question. I was raised in a Christian home and will always adhere to the tenets of Christianity but as a mystic/spiritualist (one of the most ancient of all belief systems), I have been led down many spiritual paths and have learned and gained much from all of them. I honor and embrace many forms of religion but do not belong to any of them. It is my belief that each of us should find our own path back to Heaven. My path is not limited by any one religion but is a path that seeks to honor Divinity, Nature, and the Spirit within. Candle Charms is simply an expression of all I have learned. 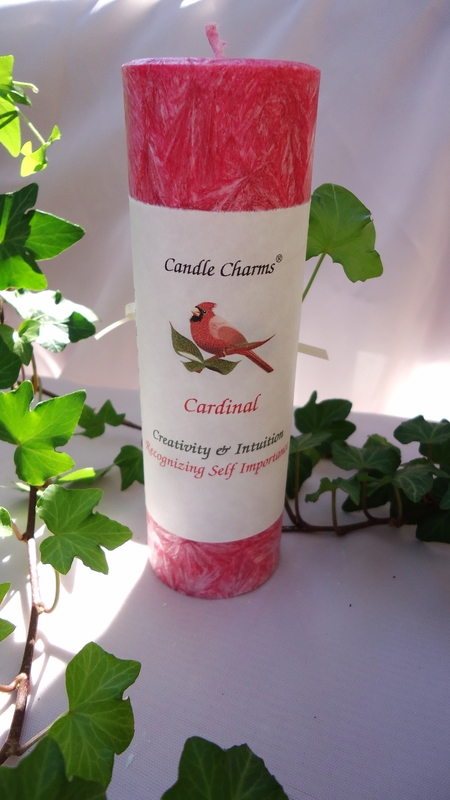 By blending ancient spiritual teachings, combining the magic of nature, and infusing the actual creation of each candle with intentions of love, blessings and healing, I trust that these wonderful, beautiful Candle Charms may bless all who choose to burn them. Wishing you all many blessings.